In many dairy processes, whey (milk permeate) occurs in large volumes as a by-product. Whey has a high lactose content and has to be disposed, which is expensive and has environmental impacts. By recovering the lactose with ultrasound, the whey effluent can be drastically reduced, whilst the recovered lactose is a marketable product. Ultrasonication promotes the fast and efficient crystallization resulting in a high yield of uniform lactose crystals. Lactose is produced from a concentrated solution of lactose (gained from whey). The concentrated lactose slurry must be cooled to a low temperature to precipitate crystals. After the precipitation step, the lactose crystals are separated by centrifugation. Afterwards, the crystals are dried to a powder. Ultrasound is well-known for its positive impact on crystallization and precipitation processes (sono-crystallization). Sonication improves the formation and growth of lactose crystals, too. Sono-crystallization of lactose helps to gain the maximum yield of lactose crystals in a minimum time. A good crystal growth is substantial to ensure an efficient harvesting and washing of the lactose (extraction & purification). Sonication causes a supersaturation of lactose and initiates the primary nucleation of lactose crystals. Furthermore, continuous sonication contributes to a secondary nucleation, which ensures ar small crystal size distibution (CSD). Due to the large dairy production, whey is often a by-product that is treated as waste effluent. The disposal of liquid whey is cost-intensive due to its high biological oxygen demand (BOD) and water content. When the lactose is recovered from the whey, the waste product is utilized in a post-processing step to produce lactose powder. The lactose recovery reduces the BOD of whey by more of 80% making the by-product useful and more environmental-friendly. An ultrasonically assisted crystallization process improves the crystal growth, yield and quality. Lactose is used widely as ingredient in the food and pharma industry, as raw material for the production of lactitol or as base material for the microbial production of biodegradable polyesters. 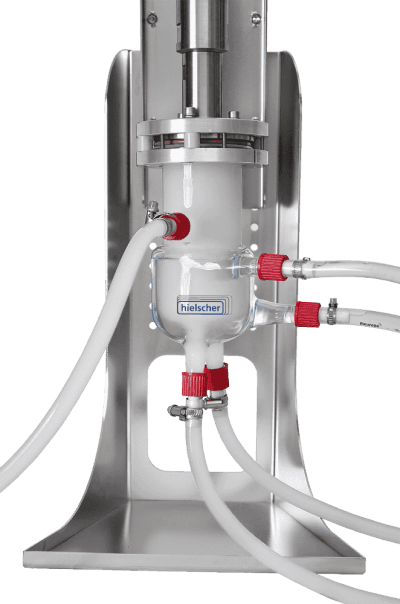 Hielscher Ultrasonics offers you ultrasonic equipment for sonocrystallization processes – either for batch sonication or for the inline processing in an ultrasonic reactor. All our ultrasonic devices are designed to run continuously (24hrs/ 7d/ 365d) ensuring the maximum equipment utilization. Industrial ultrasonic devices from 0.5kW up to 16kW per unit are suitable for the commercial processing of large whey suspensions. Hielscher ultrasonic systems are available with sanitary fittings. The ultrasonic sonotrodes (probes/ horns) and reactors feature a simple geometry for easy cleaning. The ultrasonic cavitation works as cleaner-in-place (CIP). Our sonotrodes and reactors are autoclavable. Due to a small footprint, Hielscher’s ultrasonic systems can be easily integrated or retro-fitted into your existing facility. Contact us today to get more information! 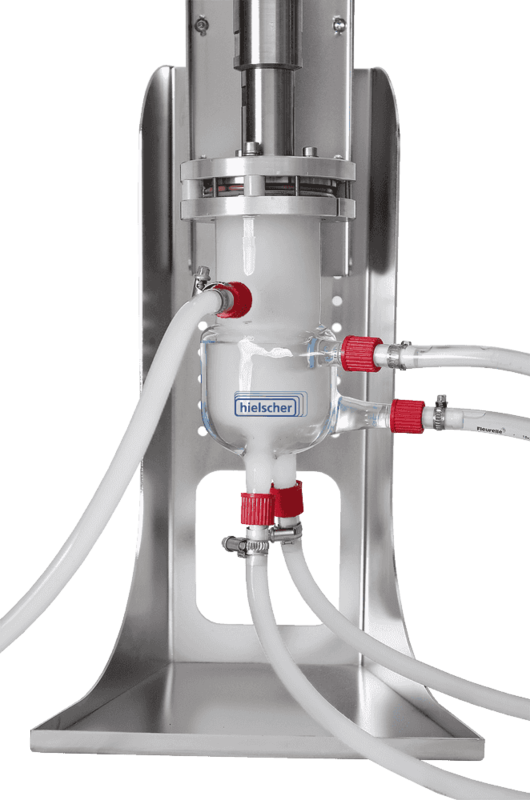 Hielscher Ultrasonics offers various standardized as well as customized solutions for ultrasonic dairy and food processes! Deora, N.S. ; Misra, N.N. ; Deswal, A.; Mishra, H.N. ; Cullen, P.J. ; Tiwari, B.K. (2013): Ultrasound for Improved Crystallisation in Food Processing. Food Engineering Reviews 5/1, 2013. 36-44. Dincer, T.D. ; Zisu, B.; Vallet, C.G.M.R. ; Jayasena, V.; Palmer, M.; Weeks, M. (2014): Sonocrystallisation of lactose in an aqueous system. International Dairy Journal 35. 2014. 43-48. Kougoulos E, Marziano I, Miller PR. (2010): Lactose particle engineering: influence of ultrasound and anti-solvent on crystal habit and particle size. J Cryst Growth 312(23):3509–20. Martini, Silvana (2013): Sonocrystallization of Fats. Springer Briefs in Food, Health, and Nutrition. 2013. McSweeney, P.L.H. ; Fox P.F. (2009): Advanced Dairy Chemistry. Vol. 3. Lactose, water, salts and vitamins. New York: Springer Science + Business Media. 759p. Patel, S.R. ; Murthy, Z.V.P. (2011): Effect of process parameters on crystal size and morphology of lactose in ultrasound-assisted crystallization. Crystal Research Technology 46/3. 2011. 243-248. Wong, S.Y. ; Hartel, R.W. (2014): Crystallization in Lactose Refining – A Review. Journal of Food Science 79/3, 2014. 257-272. Crystallization is determined as the formation process, where solid crystals precipitate from a oversaturated solution, melt or gas. The crystallization process consists in two major stages: the nucleation and the crystal growth. During the nucleation, the dissolved molecules in the solution start to form clusters, which must be large enough to be stable under the operating conditions. Such a stable cluster forms a nucleus. After reaching the critical size to form a stable nucleus, the stage of crystal growth begins. In the phase of crystal growth, the formed nuclei becomes larger as more molecules are bounded to the cluster. The growth process depends on the saturation grade and other parameters such uniform mixing, temperature etc. The classical crystallization theory is based on the thermodynamic conception that an isolated system is absolutely stable when its entropy is invariable. 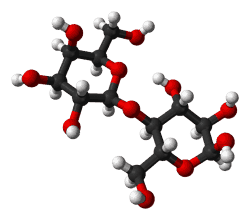 Lactose (milk sugar) is a disaccharide built from glucose and galactose connected by a β(1→4) glycosidic bond. It is the main carbohydrate of milk and is found at concentrations of 2-8 wt%. Lactose is flavorless and has a low sweetness. Lactose acts as a reducing sugar and promotes the Maillard and Stecker reactions. Thereby, lactose is used to enhance color and flavor of food products such as bakery products, pastries and confectionery. Lactose is a widely used food additive that functions as carrier, filler, stabilizer, and tablet diluent in food and pharmaceutical products. 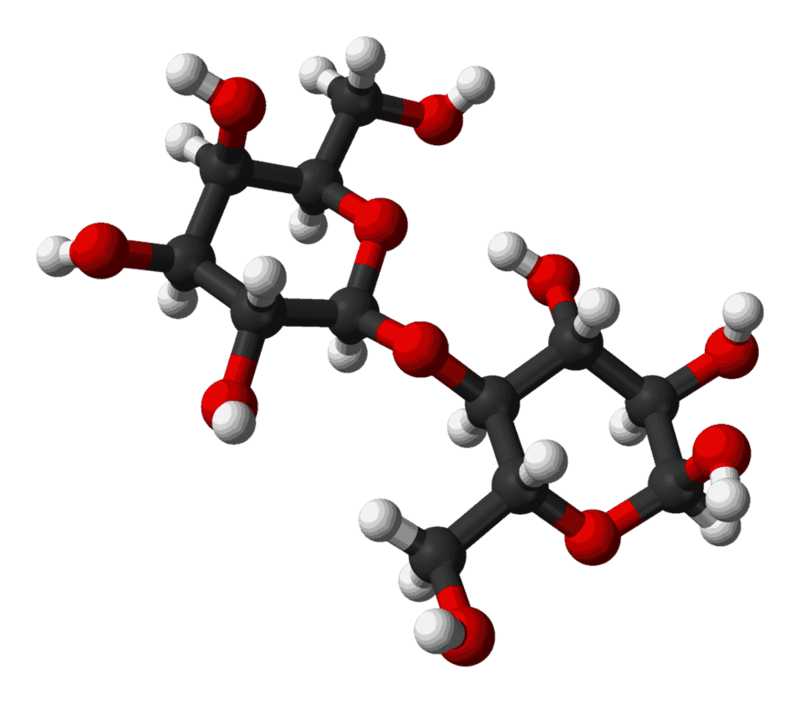 α-lactose is the purest form, which is used for pharmaceutical products. Lactose is an important ingredient when it comes to flavour, aroma and browning reactions.